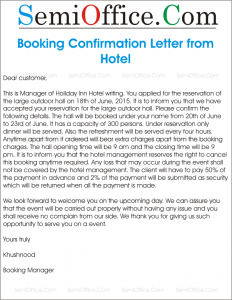 Sample letter to inform the client that your booking is confirmed in hotel. 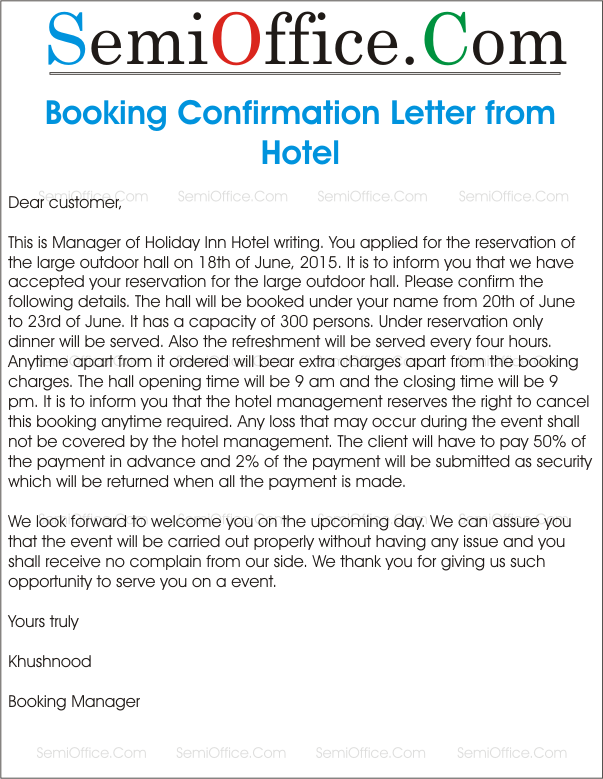 Letter from hotel management to the client for the confirmation of the booking of hall for he has applied earlier. Sample Letter for Booking Confirmation from Hotel, Restaurant, Casino, Guest House. This is Manager of Holiday Inn Hotel writing. You applied for the reservation of the large outdoor hall on 18th of June, 2015. It is to inform you that we have accepted your reservation for the large outdoor hall. Please confirm the following details. The hall will be booked under your name from 20th of June to 23rd of June. It has a capacity of 300 persons. Under reservation only dinner will be served. Also the refreshment will be served every four hours. Anytime apart from it ordered will bear extra charges apart from the booking charges. The hall opening time will be 9 am and the closing time will be 9 pm. It is to inform you that the hotel management reserves the right to cancel this booking anytime required. Any loss that may occur during the event shall not be covered by the hotel management. The client will have to pay 50% of the payment in advance and 2% of the payment will be submitted as security which will be returned when all the payment is made. We look forward to welcome you on the upcoming day. We can assure you that the event will be carried out properly without having any issue and you shall receive no complain from our side. We thank you for giving us such opportunity to serve you on a event. Dear Mr. Sam, hope you are doing well. We have just confirmed your booking. Kindly reconfirm it to avoid any inconvenience. We hope that you will have a great time with us. We are looking forward to your arrival. We wish to inform you that your payment has been received, and your reservation to book a room and conference hall at Labrador Inn on November 1st, 2018 has been confirmed. If you need any application, letter, speech, essay, we are available to help you. Just post your question in the below comments form or use Contact Us Form. We will post your required content as soon as possible and let you know at provided email address. More Than 5000 documents are available free of cost. We are continuously increasing this number. SemiOffice Corp is a free proofreading and documents distribution company. Semioffice deliver free sample of letters, applications, Emails, business proposals, business reports, essays, speeches, forms, certificates, planers and resumes for our visitors.